Hoary Bindweed is a member of the Morning Glory Family. It is a trailing plant that lies along the ground, but can grow to 3 feet in length. The plant can typically be found on dry mesas, and on hillsides between 3000 - 6000 feet in elevation. Leaves are finely haired and grass-like, growing to to 2 inches in length. 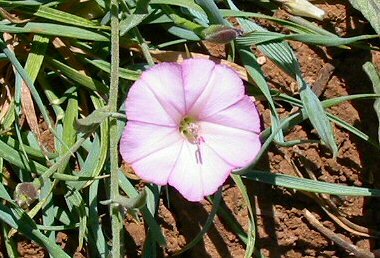 The Hoary Bindweed at right was photographed on a mesa near Sedona. The Hoary Bindweed blooms between April - October and produces a pale pink funnel shaped flower with 5 lobes to 3/4 inch in width.